STERLING, Va., Nov. 14 /Christian Newswire/ -- On November 20, 2006, Care Net’s national headquarters will relocate to the Prison Fellowship Campus in Lansdowne, Virginia. The new, state-of-the-art facilities offer exciting opportunities for Care Net to grow and serve pregnancy centers including: web-casting capabilities, spacious conference and meeting rooms, a beautiful prayer room, and a radio broadcasting and recording studio. In addition, Care Net foresees many intangible benefits to the new location as it provides a chance to work alongside a leading national ministry. The Prison Fellowship Campus consists of a 95,000 sq. foot office building and guest house, which is home to Prison Fellowship, Prison Fellowship International, and other Christian ministries; and more than 11 acres of peaceful grounds. Care Net has obtained a five-year lease to occupy approximately 6,500 square feet of office space and will have the opportunity to utilize various amenities on the campus. A plaque and cornerstone at the entrance of the main building features Prison Fellowship’s logo and the Biblical verse it represents, Isaiah 42:3: “A bruised reed he will not break, and a smoldering wick he will not snuff out. In faithfulness he will bring forth justice.” According to Care Net, this verse also has meaning for its organization and those in the pregnancy center movement who, motivated by the love of Christ, serve those facing unplanned pregnancies and stand in the gap on behalf of the unborn. Effective November 20, 2006, Care Net’s new national office address is 44180 Riverside Parkway, Suite 200, Lansdowne, VA 20176-8421. 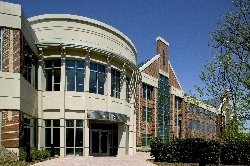 In addition to its Northern Virginia national office, Care Net operates Care Net South in Birmingham, Alabama, among other office locations throughout the U.S.